A box unearthed in a Nunavut community along the Northwest Passage earlier this month contains nothing related to Arctic explorers Sir John Franklin or Roald Amundsen, government officials have announced. 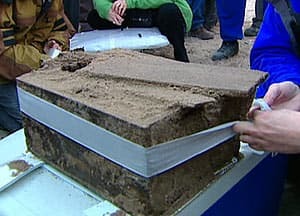 The wooden box, which was believed to have been buried for decades in Gjoa Haven, Nunavut, was opened by the Canadian Conservation Institute in Ottawa on Friday. The box was purported to contain either documents related to Franklin's ill-fated attempt to navigate the Northwest Passage in the 1840s or items from Amundsen's journey through the passage in the early 1900s. "No items related to either Amundsen or to Franklin were found." Officials with the Nunavut government and the Institute will give more details in the coming days about the box's contents. The box was believed to have been buried more than 80 years ago by George Washington Porter Jr., a resident of Gjoa Haven, below a large stone cairn. It was said that he carefully placed some documents believed to be connected to the British Franklin Expedition — Sir John Franklin's attempt to navigate the Northwest Passage.